The global cloud service brokerage market is currently witnessing a high degree of competition on account of the presence of a large number of market players. According to a new study by Transparency Market Research (TMR), Accenture Plc, Cognizant Technology, and Capgemini S.A. held the leading share in the global market. By the end of 2017, these companies were slated to collectively account for nearly 58.2% of the global market. Some of the leading companies in the market offer wide range of cloud services. Besides this, they are focusing on strategic alliances and collaborations to expand their market share. For instance, recently Google has initiated a partnership with Accenture to build cloud solutions as per the need of specific industries. According to TMR, the global cloud service brokerage market is projected to reach a valuation of US$ 22.4 bn by the end of 2024. The market is expected to progress at 23.6% of CAGR during the forecast period between 2016 and 2024. On the basis of end users, telecom and IT sector is forecast to lead the market by accounting for a share of 26.5% in the market by the end of 2024. Increasing demand for smart gadgets will in turn create growth opportunities for the market in IT and telecom sector. Regionally, North America and Europe are leading the global cloud services brokerage market. Between the two regions, North America is expected to reach a valuation of US$ 9.8 bn by the end of 2024. Globally the demand for cloud services has grown tremendously because there is exponential rise in the demand for technology-based services. Areas like IT and telecom, banking and finances, healthcare, retail, energy, and government sector are now using advanced technologies at a large extent. Thus, a cloud service brokerage organization helps customers or the users to choose right services and provide customization among various services and software. Cloud services are highly attractive as they assist in customization of cloud services, deployment, and integration of various cloud services as per the requirnment. The growing demand for hybrid cloud model has also fuelled demand for cloud service brokerage globally. It is expected that in coming years, huge volume of data will be produced owing to extreme dependence on technology and services related to it. Therefore, to organize the ever increase volume of data, the need for better storage and effective management of this data will rise. Moreover, the increasing penetration of internet across the globe and technology driven services has created lucrative opportunities for cloud services brokerage market. Conversely, thelack of awareness about benefits of using cloud services may limit the market’s trajectory. As the market is in its nascent stage the uses of the cloud services is still unknown. People still prefer to work traditionally especially in underdeveloped regions, which may stand as a roadblock for the market to grow at its full potential. However, widening penetration of internet and advanced use of technology will diminish the effect of these restraints. 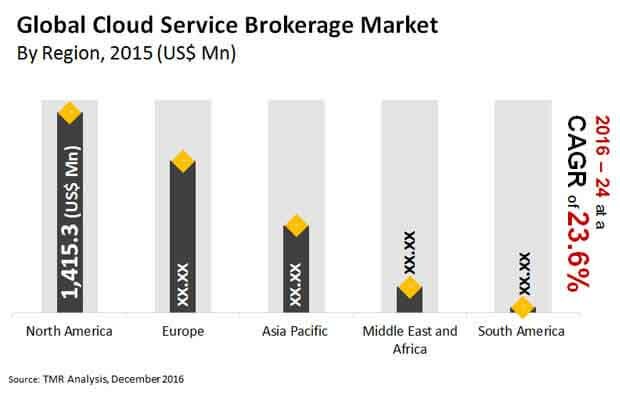 Low capital expenditure and low cost are also driving the demand for cloud service brokerage market.